When I was planning my career break, I happened to discuss it with a few people including my next door neighbour. He looked at me as if I had gone mad and exclaimed, “You might get murdered if you go off on your own in a foreign country.” I considered his words carefully. Statistically, the chances of getting murdered was very slim and you are more likely to have harm done to you by a close friend or family member than a stranger. I should know as I worked in a lifer prison for a long time and statistically most people were killed by people by either a partner, a close family member or a very close friend. So, what is it that makes us never take a calculated risk? Answer is FEAR. Fear of the unknown and the need to cling to safe territory. The second rung of Maslow’s hierarchy of needs where we cling on to safety with all of our might. The truth is we are never truly safe. Ever. We cling to our jobs but they are never truly secure. We attempt to make life safe with insurance plans and pension plans , but in the end none of us are immune to the frailties of life. Please don't think I am advocating not saving or putting away some money for a rainy day, but I hope you get the gist of what I am trying to say. People will never attempt something new for fear of the consequences and they will project their own fears on to you. Like my neighbour for example who never had ventured out of Britain for fear of the unknown. You know what I am talking about. We have all been there at one point or another in our lives. Whatever facade you put out to the world, you know who you really are. 1. Learn that it is YOU who is thinking these thoughts. Thoughts are not reality. Ever seen how a single event can be looked at with different points of view for many people? That’s because their perspective of the event is different. 2. Learning to be kind to yourself. Accept that you are going to have doubts as to whether you can really do something different. 3. Take some steps in courage. If you found it difficult to travel alone by yourself try a mini break in a different town in your own country. I went on a mini break by myself to Amsterdam and found that even if I did get lost and couldn't speak the language I could come back in one piece. That paved the way for more adventurous travel. I remember going to Malaysia a few years back and I ended up staying in a remote part of Khota Bharu. The Chinese hosts were really kind to me. In fact it helped me to restore my faith in humanity. Once I took a ferry ride to Vancouver Island and got lost and a kind lady drove me 17 miles out of her way so that I could go to where I wanted. Another time I was walking in the rain getting drenched and some people offered me lunch. I have also been offered accommodation by people I hardly know. For me these are just simple examples of people whom I've met and helped me on my travels. It has definitely changed my perceptions of the world. Despite what the newspapers say about the state of the world today, there are wonderful and kind people all over the world and I am truly blessed to have met some of them. For that I say, "Thank You." I've really enjoyed reading the blog of Sean Reiland who talks more about "Stepping into uncertainty." He voices some of the thoughts that I had when I stepped off into the unknown. 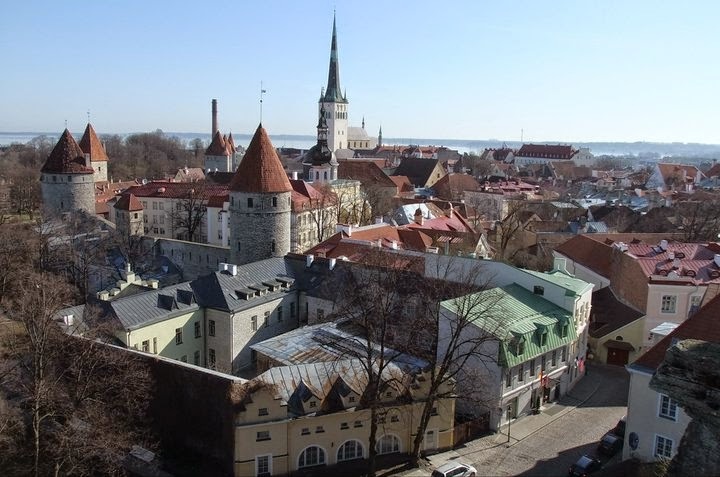 Ask any seasoned traveller who has to been Estonia's capital city Tallinn and they will all share their love of a city filled with medieval history, quirky cafes and lively bars. I was lucky that my Irish friend Tony lived there to show me around and give me hints on exploring this wonderful city. 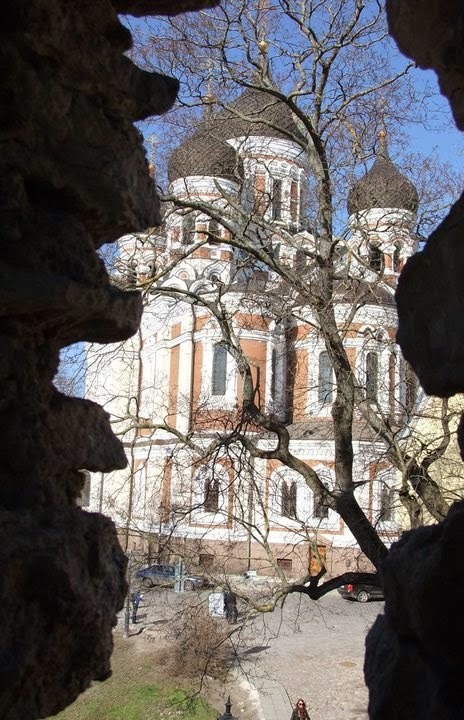 His best piece of advice was to make sure I looked up at the top of the building so I would not miss some distinctive feature in Tallinn's Old Town. Walking around the Old Town was like stepping into the pages of a history book. 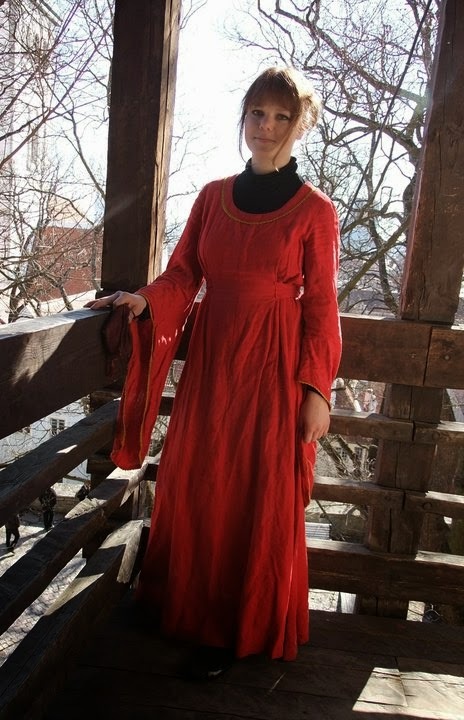 Locals dressed in medieval costumes and horses clip clopping on the cobbled stones gave an impression of what it must have been like to live in bygone era. Enticing smells came wafting through the open doors of the cafes and artisan shops, including the smell of marzipan, coffee and freshly baked patisseries. Wandering around the old city wall was a nice way of soaking up the atmosphere and thinking about the city's history which dates back to the 13th century and which had been under the influence of the Danes, Germans, Swedes and Russians. 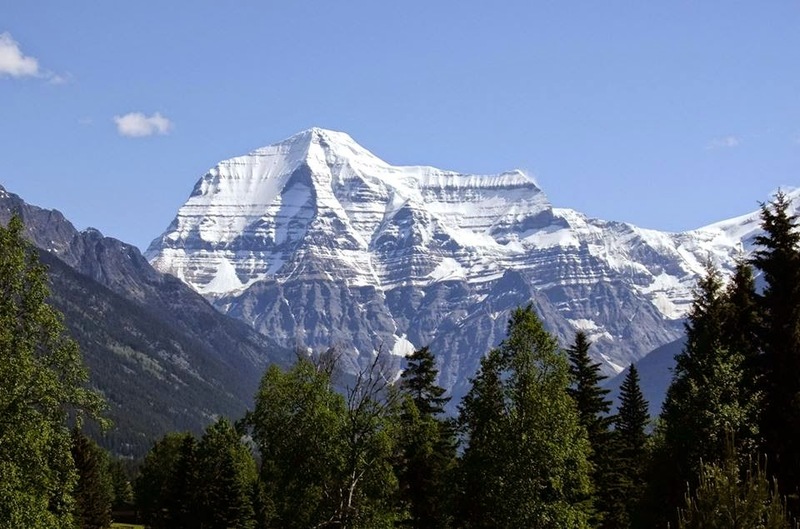 It is also a designated UNESCO world heritage site. The distinctive red roofs of the houses and red turrets of the castle wall makes it unmistakable in any travel magazine. Some of the interesting places to explore include St. Catherine's passage which is a little walkway where you can find tombstones of people in between artisan shops. A walk between life and death... Still, a very interesting place to explore. Worthy of a visit is also Kadriogg palace and the Alexander Nevsky cathedral which is famous as it is Tallin's oldest cathedral. Opulent in the inside, it was made according to the Russian Revival style during 1894 and 1900. If you are feeling hungry at this stage then a stop at the Kompressor is a must. I have never eaten pancakes like the way this shop offers. Savoury mixtures from salmon and cream fillings to the more sweet toothed variety is on offer along with good quantities of local beer and spirits. Some of Tony's friends got together and we all decided to go to the Open Air Museum called Roco Al Mare. Situated a few miles out of the city in a forest by the sea, it is a life sized construction of a 18 century fishing village. Complete with a school, a church and several houses it made you think of what it must have been like to live in that part of the century. An Estonian custom was to leave a broom at the entrance to the house so that neighbours knew you were in. If you decided to go out then the broom must come indoors to let everyone know that you were not in. Obviously, they didn't have burglars in those days. An evening barbecue party with different friends bringing delicious food to share was probably a nice way of rounding up my Tallinn adventure. It was also mandatory to try the local rum Vanna Tallinn, which was a mixture of Jamaican rum with a hint of spices including citrus oil, cinnamon and vanilla. Cheers everyone! 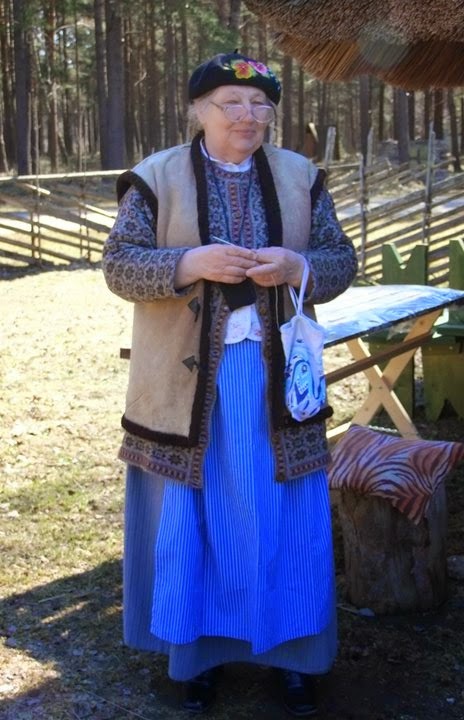 I cast my mind back to a time when I was travelling to Estonia and went to visit my friends who lived on Hiimuaa Island. Where is that you ask? 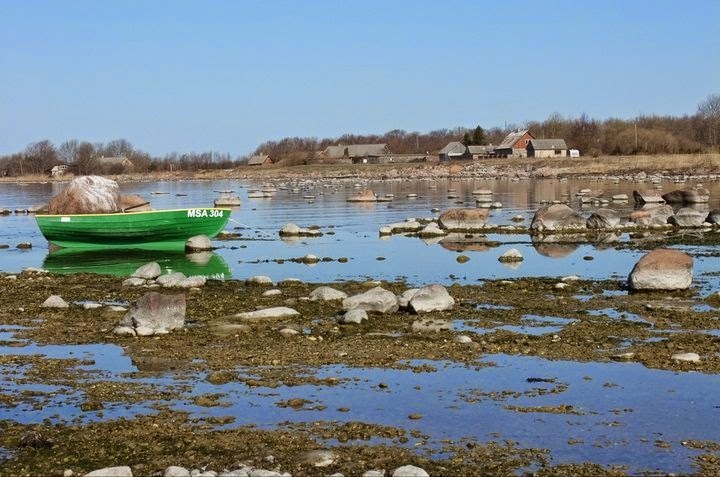 It is Estonia’s second largest island and in the winter the ice hardens and freezes so that people from the mainland can drive over the frozen Baltic Sea to reach it. This includes trucks that weigh quite a considerable amount. No, the ice road wasn't there when I went to Hiimuaa, but it was a lovely spring day as I took the ferry and another bus to reach my friends who lived there. On their kitchen table was a beautiful display of flowers and Easter bunnies that the kids had made. It was a real pity that I could not communicate with the children as they didn't know any English but the language of smiles reaches across all cultures. I went outside by myself to explore. The spring flowers were just putting their heads out in the warm sunshine and the sea sparkled and glistened as if it was offering me a palette of many colourful jewels. I walked along the beach feeling the saltiness of the spray and skimmed some pebbles into the sea. I was alone in my thoughts, but pondered the history of the island which was quite different to its present day calm atmosphere. Early human settlements were found on the island dating back to 4 century B.C. It has also been under the jurisdiction of both the Soviet Union and Germany during World Wars I & II. It was hard to imagine that I could wander about so freely and yet at another time the island was closed to mainland dwellers and foreigners. 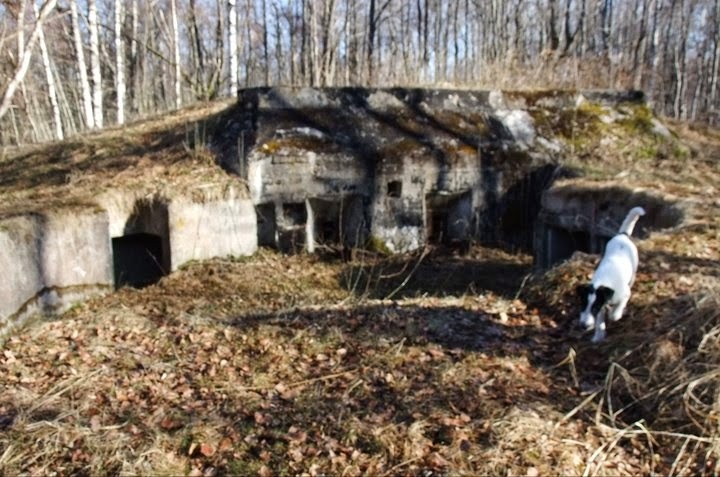 Examining some bunkers made in the times of the Soviet occupation brought this sharply to my mind. If you come to Hiimuaa, it’s because you love nature for there are no bars and clubs anywhere. We took a car ride across the island and watched in silence at the antics of some moose and elk. Did you know that elk have antlers for only two weeks of the year to attract a mate? My friends said that often islanders offer to take in a stranded tourist who had missed the last ferry back to the mainland. Perhaps it’s because of this trait that I found the island fascinating. Listening to some people’s personal histories as to what happened during the war years and yet offer hospitality and trust to strangers was remarkable in a day when common decency is fast disappearing. 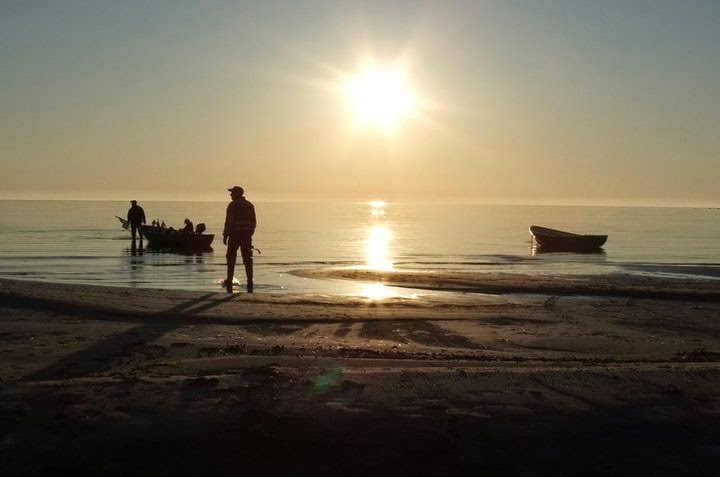 In the evening we went out in a boat to do some fishing and sat in companionable silence as the sun set cast its final glow across a dead calm sea. It’s one of those moments when you feel at peace with the world and yourself. Whenever you are considering taking a career break to travel, why not think about volunteering abroad. It's a rewarding experience and in many ways a very humbling one. My interest in volunteering started about 10 years ago when the Boxing Day Tsunami hit coastal communities in Indonesia, India, Sri Lanka and Thailand leaving with it a trail of human suffering of unimaginable proportions. I felt the need to do something and was galvanized into action by raising money from work and other charitable foundations. The money raised went to build 13 houses in Sri Lanka for families of fisher folk who had lost everything. Later on in the year, I spent my holiday in Sri Lanka volunteering for a charity called Help Lanka who had their head office in the UK. During my interview with Sam Goonatilleke, Director of Help Lanka, he asked me whether I would conduct an operational audit of the organization and also take part in the donation distribution and teaching English program. Once I had my criminal records check clearance, I was able to fly to Sri Lanka. When I was there, I took part in aid distribution and the English teaching program for children in orphanages. It was such a moving experience to see the children's eyes light up with joy at the small gifts we had brought them. Nothing could erase the suffering that these children had undergone, but showing we cared was the very least we could do. During my career break, I went to see a little girl called Paavani whom I had sponsored through Help Lanka's child sponsorship program. 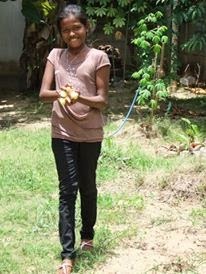 She lived in a very remote part of Sri Lanka in a place called Chilaw. 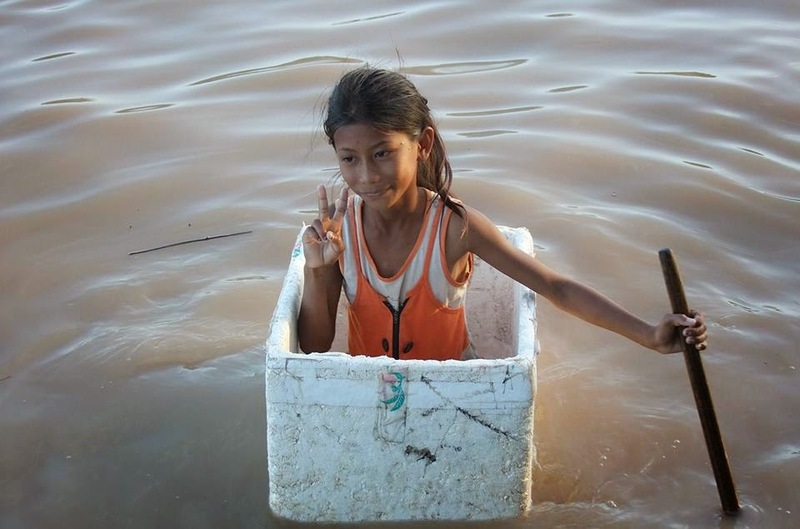 The sponsorship money helped her to have an education and give her a hope for a better future. I spent time with her learning about her life and talking to her family. 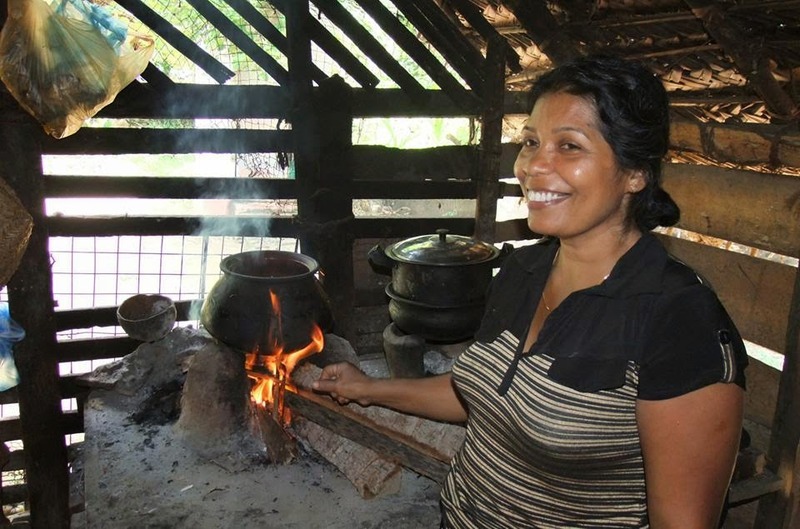 The family lived in a mud thatched house with tightly plaited coconut leaves for a roof. The mother used to cook food in an indoor fire-pit which was very smoky and I am sure this made her suffer from ill health. 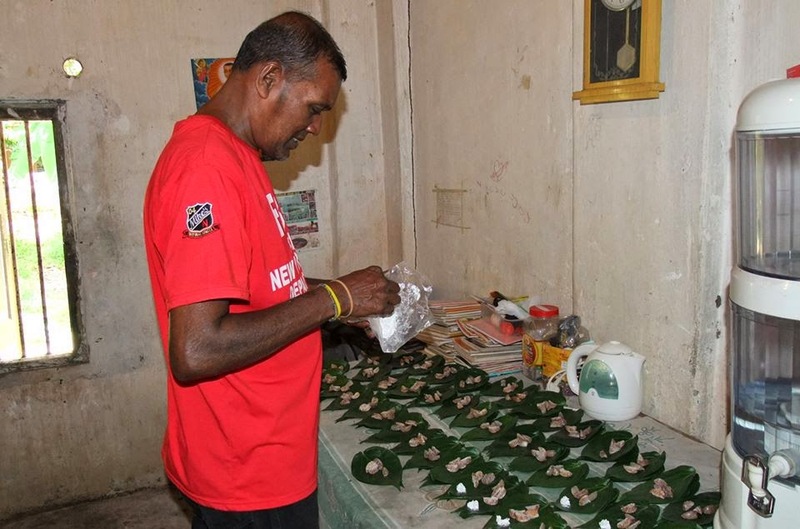 Paavani's father used to sell Betel leaves at the local market for a few rupees per day. People use the leaves for its medicinal and mouth cleansing properties. When I met them for the first time, it was like meeting friends as I had corresponded with the little girl for some time. I thought I was helping them, but in fact they gave me the gift of friendship and hospitality and it wasn't because I was sponsoring Paavani. They were genuinely nice people. Hope I've convinced you that volunteering abroad is great. Let me know your stories - I would love to hear them. 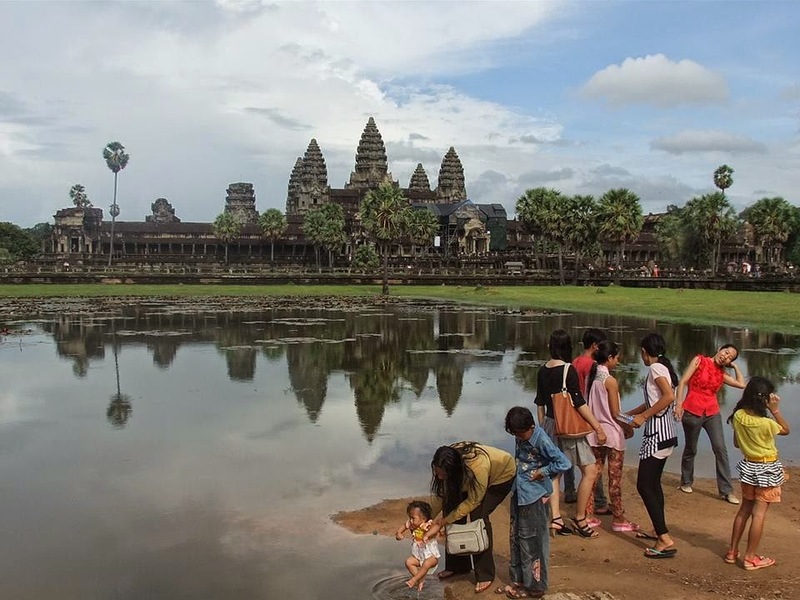 Whenever someone mentions Siem Reap in Cambodia, people automatically think of the famed Ankor Wat temples. Built between 1150 and 1113 A.D. its one of the largest collection of temples in the world and the name means: 'Temple City." Although, it was originally built as a shrine to a Hindu god Vishnu, it became a Buddhist temple as time progressed. Many people remember Harrison Ford and the film Indian Jones which was filmed on location at Ankor Wat. This setting was also used for the Tomb Raider film starring Angelina Jolie. I was naturally keen to investigate these awe inspiring monuments to the gods and was glad I made my way to see them. 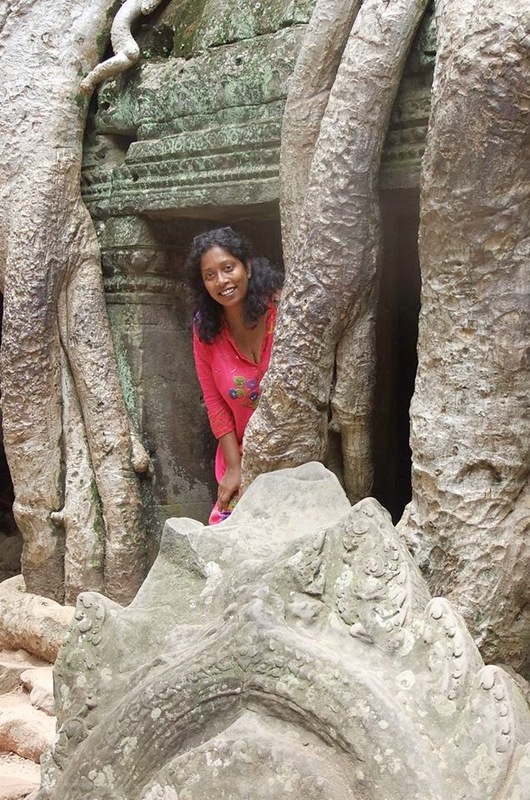 Ancient trees with long roots wrap around some of the temple ruins making it a surreal experience. It was hard to imagine that these temples which inspired great religious fervour were left to ruin, and were rediscovered by Portuguese missionaries around 1580 A.D. At one time, there were over 1000 temples on site. 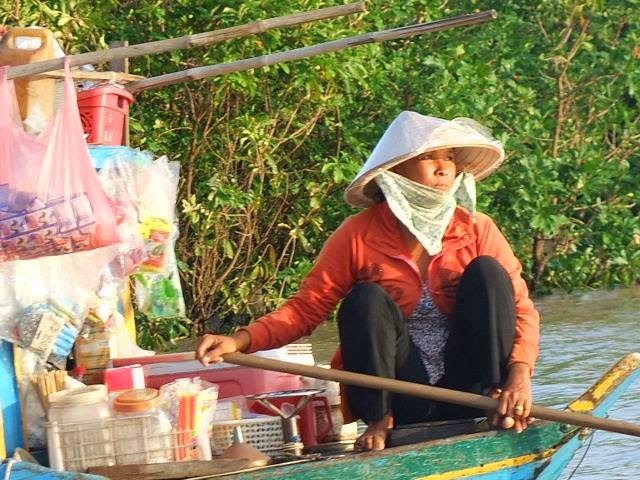 Following on from the visit to the temples, one of the other places I visited was the Ton Le Sap river community which can be reached by water taxi. It was an eventful ride as we spotted a water snake in the river and the lady next to me decided to scream her lungs out. I was really glad neither of us landed in the water to keep the snake company! 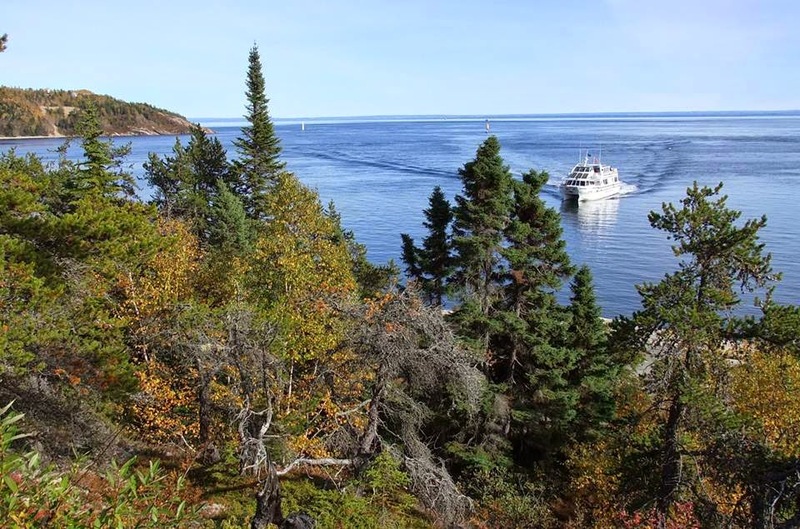 My friends in England told me that if I was keen on watching whales in Canada, then I must head off to Tadoussac, a tiny town situated near the Saguenay and St Laurence rivers. My friend Maxine with whom I stayed with in Quebec echoed this sentiment saying it’s a worthwhile visit. Maxine is a keen sea kayaker and her whale encounter tales kept me entertained for a whole evening. Tourists flock to this small town in droves, and what draws them is the presence of whales or baleines as the locals say in French. 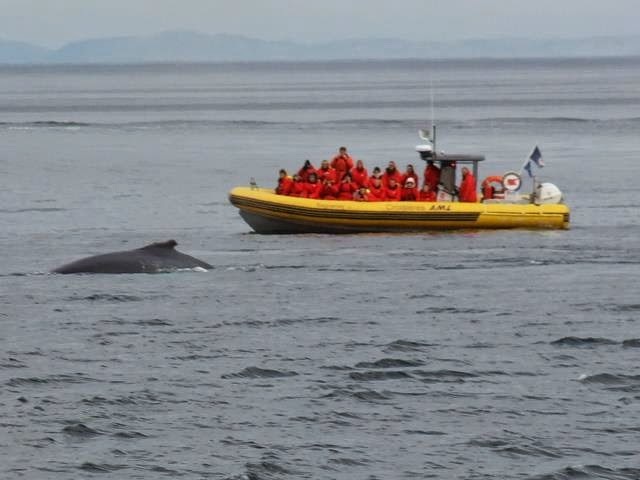 The Zodiac boats zip along the sea in search of belugas, minkes and humpback whales, while passengers gasp in wonder at these magnificent sea creatures. There are other activities such as sea kayaking, surf biking, walking by the dunes and spending time in the Marine Mammal Interpretation Centre or better known as the Whale Museum. The numbers of campers during the peak season pass the time in the evenings gathered round a camp fire swapping tales of whale sightings. I got invited to join some of them for an evening barbecue. The impromptu camaraderie made it an excellent way of passing the time while tucking into a smoky spare rib or two. 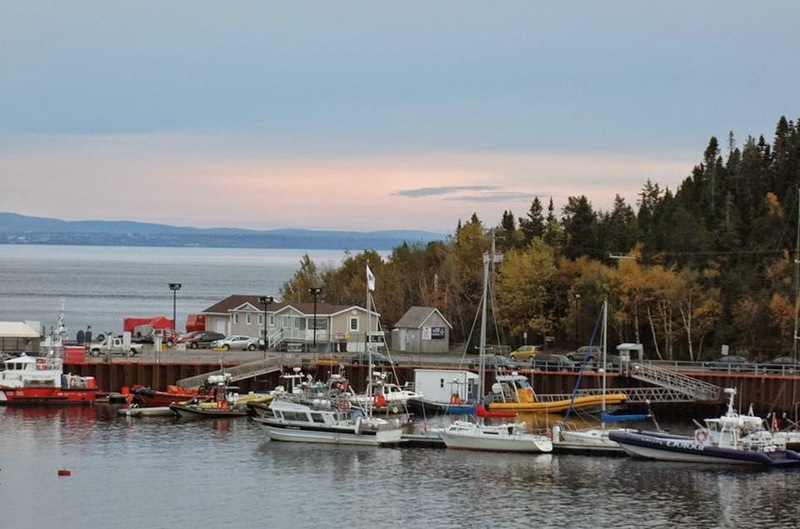 I loved the small town feel of Tadoussac and the locals were very friendly. I tried to brush up on my school girl French before I went there which seemed to work some of the time, but it left quite a few people thoroughly confused. Nevertheless, I got my tickets and pulled on my wet-suit hoping to see the whales. Remembering to wrap up really warmly when out on a boat or Zodiac is important as the temperature can drop several degrees out at sea. After a while, we were rewarded with the sight of a humpback doing a roll. Another came quite close to the boat and dived. Perhaps it was the unexpectedness of the event that made me feel quite emotional and soon there were tears rolling down my cheeks and plopping down onto my jacket. I had so longed to see whales in their natural habitat that the fulfillment of that dream made me experience an emotion I could not quite fathom. The next morning tucking into a traditional Quebecois breakfast of crepes, I talked to a retired Dutch doctor and his family. I will never forget his advice to me, “Follow your heart Sheona and choose your next career with care.” It was definitely something to ponder on as I waited for the ferry to take me to Trois Rivieres. When I was in Poland, I made friends with an Israeli lady who was also visiting Auschwitz, the concentration camp where so many Jewish people lost their lives. She asked me to visit her native land one day and we continued our friendship by email when I returned back to England. I was fortunate to have been able to stay with my friend during my visit to Israel or Holy Land as it is also called. Her family were very hospitable and took me to many historic sites in Tel Aviv, Jaffa and Jerusalem. The most famous Islamic shrine in Jerusalem is the Dome of the Rock which is built over a sacred stone. This stone is believed to be the place from which the Prophet Mohammed ascended into heaven. My friend took me to visit some Ethiopian Jews who had sought refuge in Israel. It was humbling to hear of their struggles to escape Ethiopia and being airlifted to safety by helicopter. They shared with me a simple meal and we danced an Ethiopian dance which was fun to take part in and a perfect end to my Israel trip. Have you travelled to Israel? What was your best experience there? Visit Sheona's profile on Pinterest.